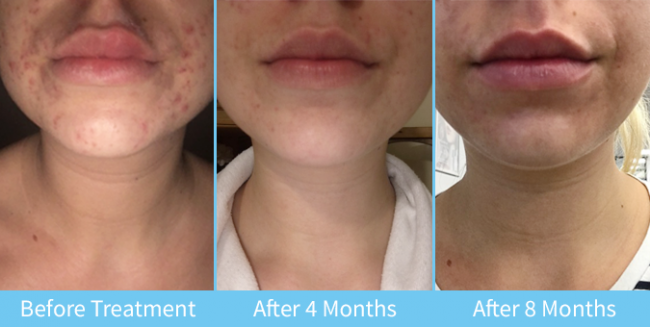 If you suffer with the effects of acne or long-term acne scarring, there’s hope. The latest developments in cosmetic enhancement have made it possible for us to dramatically improve the appearance of your skin. At Courthouse Clinics, we have an entire team of dedicated professionals who have been trained to perform a wide range of treatments such as Skinrolla, Omnilux Blue Light Therapy, Skin Peels and Pixel Laser Resurfacing. Skinrolla is a skin-needling treatment that stimulates skin regeneration and repair without causing unnecessary damage to the top layer of your skin. Your cosmetic doctor will use a barrel-like roller over your skin to trigger new collagen and elastin synthesis. This treatment is ideal for acne scarring. lightfusion™ Light Therapy is based around Photo Dynamic Therapy (PDT). This technology targets acne-causing bacteria responsible for breakouts. By destroying the bacteria, your skin has time to heal and clear. This treatment is ideal for active mild-to-moderate acne. Skin Peels are a great way to safely resurface your skin and encourage cell regeneration. Skin peels can be used eliminate mild-to-moderate acne, or to target permanent acne scarring. We offer several types of skin peels for all skin types, tones and conditions. Pixel Laser Resurfacing can target your acne scars without damaging the surrounding tissues. This creates a faster healing response than other laser resurfacing techniques. Pixel treatments encourage collagen production beneath the skin to fill-in acne scar depressions. All treatment suggestions are a guide, and only your aesthetician can make a professional assessment as to which treatment will be best for you. We offer a free skin health assessment, so book your appointment to discuss what’s right for you. This common type of scaring is usually deep, very narrow and extends into the dermis. The skin surface looks as though it has been pierced by an ice pick- hence the name. Some ice pick scars are large in size and often look similar to an open pore. Boxcar scars are usually rounded or oval shaped depressions in the skin with steep vertical sides. This type of scarring is also very common in acne scarring sufferers. Much wider than the ice pick, they resemble the scars left by chicken pox and are usually found on the cheek area. Rolling or “wave-like” undulations across otherwise normal-looking skin is caused by damage under the skin’s surface. These scars tend to be wide and shallow in appearance. Hypertrophic scars are raised from the skins surface and firm in texture. These types of scars are commonly found on the back or chest area of the body but can also appear on the face and neck. Hypertrophic scars usually reduce in size over time. Keloid scarring is a form of Hypertrophic scarring. What are the two main types of acne scarring? Ice pick and boxcar scarring are considered the two most common types of acne scarring, and are the result of persistent acne. Most ice pick scars are very narrow, but run deep below the surface layer of the skin. Boxcar scars are similar to ice pick scars, but wider. They are oval in shape, with well-defined edges. Ice pick and boxcar scars are most commonly seen on the temples and cheeks. Deep acne scars are often attached to structures and tissues beneath the skin, giving them a depressed appearance. Subcision is a technique that undermines deep acne scars using a sharp instrument such as a needle or tiny scalpel. The instrument is introduced through the skin and used to break up fibrous bands of scar tissue and free the scarred area from its deep attachments. This process encourages collagen production, and allows acne scars to rise and flatten. Subcision is performed under a local anaesthetic to ensure patient comfort. Punch excision is a surgical technique that can be used to correct deep acne scars (eg ice pick and boxcar scars). During this procedure, your cosmetic doctor will use a punch biopsy tool (circular blade) to cut out deep acne scars. The remaining skin edges are then sutured together with a single stitch. Punch excision is performed under a local anaesthetic to ensure patient comfort. Active acne and acne scarring are difficult conditions to treat. The severity of your acne will ultimately dictate your final results. Treatments can significantly improve your appearance, but they may not be capable of removing all traces of acne. Prior to your procedure, our surgical team will work with you to design a personalised treatment plan to help you achieve the best results possible. Who is suitable for surgical and non-surgical treatments? If you are self-conscious about your acne, you´re likely to be a good candidate for surgical and/or non-surgical treatments at Courthouse Clinics. As a general rule, the best candidates will be in good health and have realistic expectations. The best treatment for you will depend on the type and severity of your acne. We offer a variety of treatments, which can be performed solo, or in combination, to achieve desired results. Our team of dedicated professionals will be able to determine which procedure – is best for your skin during a private patient consultation. The staff are friendly and approachable- I’m always made to feel welcome. There are no pushy sales tactics employed; I get the treatment I have asked for. Thank you Courthouse Clinics for giving me back my confidence! I’m so pleased that now my acne scarring has cleared up I no longer have to pile on the concealer to cover up. Your staff have been fantastic.